Poles Apart by Marion Ueckermann is a delightful Christmas story that moves from the heat of Africa to the ice and snow of Finland. It is a novel about the true meaning of Christmas – the love and hope that can be found in Jesus. Sarah gave up on Jesus after being hurt in the past. She believes God is punishing her and wants nothing more to do with Him. Her sister Hannah wisely told her “don’t block God out because of man’s mistakes.” Sarah cannot deal with the expectation and pressure to attend church at Christmas. She escapes for three weeks to Finland, the home of Santa. Niklas steps into his father’s role as Santa, and meets Sarah. In the hope of beating her writers block, Sarah interviews Santa, not realising that he is the owner of the log cabin where she is staying. The main theme of the novel is forgiveness. Sarah is holding on to hurt. It is not only ruining her life but it is affecting the lives of her family. She is told that “unforgiveness will only hold you captive.” Often the shackles we are bound in, are those of our own making. Sarah is terrified of being hurt again but has forgotten about grace. To forgive in our own strength can be impossible, we need Jesus to help. Sarah needs to move from captivity to freedom. She needs to let go of the past, and forgive, in order to move into the future unshackled by the chains of the past. The characters of Niklas and Sarah are well drawn and realistic. There is a magical air to the novel as Niklas takes the role of playing Santa very seriously. The whole novel has a wonderful feel to it. The setting is idyllic, a real winter wonderland. I love all of Marion Ueckermann’s novels. I always finish reading with a lovely warm, fuzzy feeling inside. If you have never read a story by her, then you are missing out. 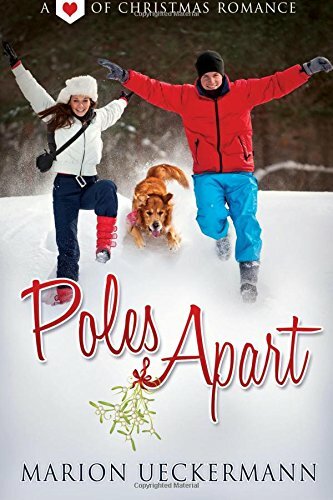 Read Poles Apart today, it’s perfect for that run up to Christmas.